Kyiv Contract Fair (Київський контрактовий ярмарок; Kyivskyi kontraktovyi yarmarok). An annual contract fair held in Kyiv from 1798 to 1927. It was transferred from Dubno in 1797 by Tsar Paul I to enliven the economic life of Kyiv. The fair was first combined with the existing Vodokhreshchenskyi (Blessing of Water) Fair held during the Feast of the Epiphany (from 15 January to 1 February). From the middle of the 19th century, when the fair was held from 5 to 25 February, during the Feast of Christ's presentation at the Temple, it was also called the Stritenskyi (Candlemas) Fair. After a fire in 1811 destroyed the first hall built for the fair in 1801, in 1817 it moved to a two-story building designed by V. Heste and located in the center of Podil, the main trade sector in Kyiv. The fair was an important commercial institution attended by merchants from throughout the Russian Empire and abroad and by burghers and estate owners, especially from Right-Bank Ukraine. The main objects of trade were wheat, manufactured goods, and, from 1840, sugar. In 1862 sales totaled 915,000 rubles. In addition, various financial matters were settled: loans and credit were secured, agreements for the future delivery of goods were concluded, and land was sold or leased. 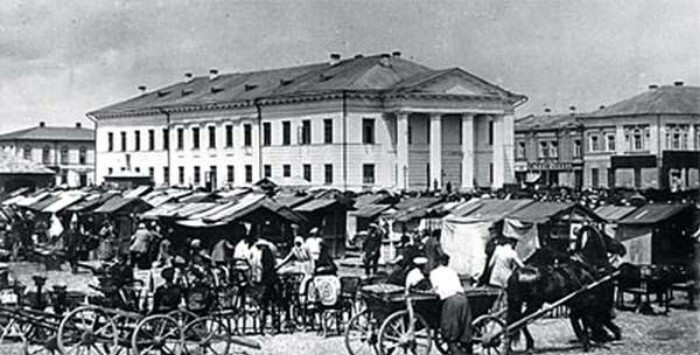 The importance of the fair fluctuated because of competition from fairs in Kharkiv and elsewhere; at the end of the 19th century 5–6 million rubles' worth of goods were traded at the Kyiv fair. By that time it had lost most of its importance as a contract fair and had become a regular wholesale fair. Under Soviet rule the significance of the fair continued to decline steadily until it was finally closed in 1927.